We encounter-ed this beautiful and elusive bird in a most unexpected place—on the trail at about 7000 feet. We were descending from Lost Mine Peak in the Chisos Mountains when this Greater Roadrunner (Geococcyx californianus) zipped in and out of view on the path in front of us. I was lucky enough to snap a few images before it disappeared again into the bush. Having seen several roadside, cruising by at automobile speeds, these artful dodgers are always long gone before I can ready my camera. Standing on the shore of the Rio Grande it is hard to believe that just feet away is another country. This river, the border between the United States and Mexico has many bends and many faces. In this place it takes on the character of the beautiful Santa Elena Canyon. In the picture, Mexico is the left wall of the canyon. Kim and I spent the morning hiking the canyon in Big Bend National Park. In the July Texas heat, there were moments it would have been nice to be in the shadows of the tall canyon walls on the Mexico side. This has truly been a trip of firsts. Last evening, shortly after dinner, our campsite darkened quickly with ominous storm clouds billowing over the mountain. Luckily, before the rain poured and the winds blew fierce, I had a short opportunity to try and capture the beauty of some the nearby lightning strikes with my camera. I had no special equipment. I couldn't even use a tripod with the blustering wind. To put it simply, I got lucky. I managed to catch four or five strikes out of hundreds of shutter releases. Still, I am pleased to be able to add these images to EduPic. Incidentally, it turned out to be quite a long night with our tent constantly buffeted by the wind, shaken by thunder and rain, and flashed by nearby lightning. It was interesting to note on our hike the next morning the numerous lightning charred trees along the trail! Yesterday, I stopped from my road trip for a rest and lunch in the Catahoula National Wildlife Refuge in Louisiana. The gulf fritillary (Agraulis vanillae) is a species that I've long wanted to photograph and one that doesn't often make it to my area. I was lucky enough to spot two individuals while there. I got so focused on following the one pictured here that I found myself standing in a fire ant mound. Needless to say that it wasn't very long before I discovered my misstep. Wow! I never knew we had sandstone arches to rival, in size and quantity, those found in the West right here in our own backyard. They are all the more awesome in the way they surprise the hiker. You round a bend on the trail in the Big South Fork National River and Recreation Area and towering above you is North Twin Arch (pictured here.) And even more amazing is that in just another minute on the trail and you're standing beneath the equally impressive South Twin Arch. In fact, this region within the Cumberland Plateau, which includes the recreation area, national and state forests, and state parks, contains hundreds of such arches. Just a note: In hopes that there are folks out there actually reading this blog, and thank you if you are. I want the reader to know that I'm travelling for the next few weeks and will not be adding posts as regularly as I would like. On a hike in False Cape State Park, I spied this male Palamedes Swallowtail (Papilio palamedes) patrolling along the jeep trail in search of a female. Curious, I followed him for a few minutes. 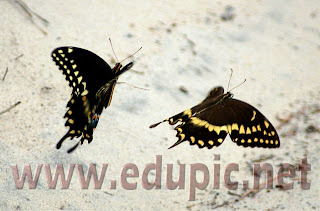 He located a female and they began a mating "dance", fluttering and flirting in small loops of flight around each other. The habitat of the palamedes is the forests, savannas, and swamps of the Atlantic and Gulf coastal regions. Sadly, this male was rejected and they both flew off in different directions. I used some of my photographs to made a short movie of the mating dance that can be found here. 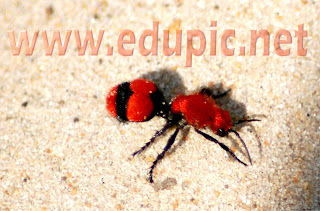 In False Cape State Park, Virginia, this female velvet ant (actually a type of flightless wasp) was seen frantically scurrying about the sandy ground in search of bumble bee burrows. This species, Dasymutilla occidentalis, is called the"cow killer" because her sting is very potent and painful. She deposits her eggs in the brood chamber of the bee which when it hatches then feeds on the bee larva. Today, hiking down an old jeep path in Curritick National Wildlife Refuge, I crossed paths with this cautious cottonmouth (Agkistrodon piscivorous) commonly called a "water moccasin." It clearly showed me how it gets its name by opening wide, exposing the white lining of its mouth, to let me know not to approach to closely. This snake is highly venomous and is the only semi-aquatic pit viper in the world. It showed very little aggression, just due warning, and when I gave it a clear path it bounded, alternately coiling and springing forward, towards and into a nearby drainage canal.